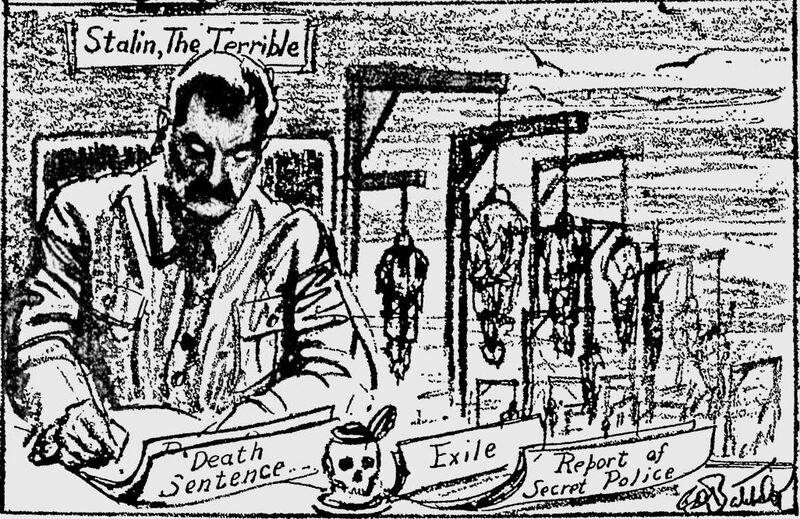 The political cartoon above shows 4 men ,who were identified and involved in public show trials, saying that they are guilty and is a traitor who tried betraying the Soviet Union. I chose this source as I find it interesting, why would someone confess their offences or crimes with a smile. After reading up, I realize that they did not actually commit those crimes but they admitted and confessed to crimes they did not commit, after having being tortured or having their families threatened. It showed Stalin's rule did not benefit USSR as it showed how scared and obedient people were that they were willing to be executed and accused of committing a crime that they did not do, to protect their families . It showed how scared people was towards Stalin that they are even willing be accused of committing a crime. The picture above shows an examples of the propaganda posters used during Stalin's rule so that he could appeal more to the public and to gain more support from the people of the Soviet Union. I chose this source as it showed that he was very well-respected by people as people are all looking up to him. It showed how great he was so that he gain more support. In this poster, he is much taller than the others to show how powerful and mighty he was. This source shows that Stalin's rule was beneficial for the USSR as they would have a leader that is confident and had plans for the country. It showed that Stalin was confident and would be able to lead the people towards a better life. The source above is a news article which states that six million died in the soviet famine as crops were seized and animals were starved. I chose this source as it shows the severity of famine at that time. Due to ambitious targets of the Five-Year Plans, grain and produce were collect at the expense of the farmers. Farmers could not keep produce for themselves and they were forcibly taken by Party officials. During Famine, the state did not distribute its stockpile grain, but sold it overseas to raise funds for more industrial machinery and development, resulting in more than 6 million peasants to die due to extreme food shortages. It shows that Stalin's rule was not beneficial as many was starved to death and some suffered from illnesses and malnutrition. Stalin cared more about earning money for industrial machinery rather than the well-being of the people. The people also had no rights as crops and produce would be forcibly taken away from them even if they hide it. The source above shows the that many suffered from "Death Sentence", "Exile" and "Report of Secret Police" under Stalin's Rule. I chose this source as it showed what many people feared at that time. Under Stalin's Rule, many were living in fear as they were afraid of being suspected , caught , executed and killed. Secret police had informers everywhere, and the slightest indication of anti-Stalin sentiments could warrant an arrest. People was always watched and judged by Stalin's officials. If they stood out for wrong reasons or upset officials or have been suspected, they could fall victim to secret police and sent to labour camps or killed. It showed that Stalin's rule was not beneficial as many were living in fear most of their time. They could be killed, tortured and abused any moment . It led to a distrust in people as they could be betrayed or accused . Many could not enjoy their life and had no freedom. In conclusion , Stalin was not a savior of the USSR. Although some of the stuff he did benefited the people, however, majority of the stuff he did , did not benefit the people of USSR. Under Stalin's Rule, millions suffered from The Great Terror through purges and show trials. People often had to confessed to the crimes they did not commit. Purges and show trials had let to many killed which resulted in loss of intellectuals, skilled works and officers. The Great Terror have also lead to people having to live in fear as they do not know what will happen to them. They might be sent to labour camps, be separated from their loved ones or be killed. Under Stalin, there was also a fall in standard of living. Many faced poor living conditions with lack of necessities , essentials and food. Due to the Five-Year Plan, many was suffering from famine. there was a shortage of food yet Stalin still went ahead and sold food and crops which people needed in order to survive to other countries to earn more money, resulting in death of six million people. He neglected the well-being of the people and only cared about achieving his targets and goals which he believed would benefit the people. Hence, Stalin was not a savior of USSR.